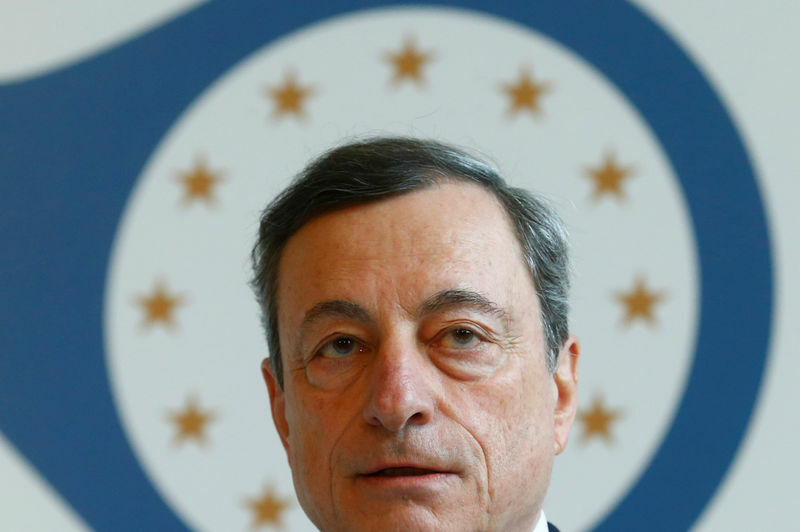 (Bloomberg) — Mario Draghi is on the verge of a watershed moment in the European Central Bank’s efforts to leave behind its crisis-fighting monetary policy. Chief Economist Peter Praet on Wednesday signaled the bank’s first formal round of talks on when to stop buying bonds is imminent. That would start the process of bringing down the curtain on stimulus efforts that have resulted in almost 2.5 trillion euros ($2.9 trillion) of bond purchases since 2015. While Draghi, the ECB president, could still delay a public announcement until July, Praet’s comments sent bonds lower and pushed the euro to its strongest level in two weeks, as investors prepared for the conclusion of emergency stimulus and a potential shift toward higher interest rates in 2019. Market expectations are that bond buying — currently running at 30 billion euros a month — will be tapered to zero by the end of this year. Bloomberg reported Tuesday that policy makers are likely to use their June 14 gathering for the first formal discussion on winding down the program. In money markets, investors are betting that the ECB will raise the deposit rate by 10 basis points in September 2019, one month earlier than the pricing a week ago. Now may be a suitable time to for the central bank to act. Inflation jumped to 1.9 percent last month, albeit on the back of stronger oil prices that have since faded. The Governing Council meeting in Latvia — one session a year is held outside the ECB’s Frankfurt headquarters — will be accompanied by fresh forecasts that are likely to show economic growth continuing, even if at a slower pace than last year. While concerns remain that the bond-market scare that hit Italy last week could resume, and spill over into neighboring countries, that risk appears to be contained for now. The ECB also frequently says that it sets policy for the entire euro zone. On Wednesday, Praet said “waning market expectations of sizable further expansions” of QE reflect an improvement in the inflation outlook. The ECB is trailing its biggest peers. The Fed announced a tapering of its own bond-buying at the end of 2013 and is next week set to raise interest rates for a second time this year. The Bank of England also raised borrowing costs in November for the first time in a decade, and India’s central bank did so on Wednesday for the first time since 2014. Quantitative easing in the euro zone started more than three years ago following months of debate as the region dived toward deflation. Interest rates had already been cut below zero in mid-2014. The central bank pledged to keep buying debt until inflation is on a sustainable path toward its its goal of just under 2 percent, and can be kept there without monetary support. Weak inflation is a phenomenon that has perplexed central banks in the industrialized world since the financial crisis. Even in the U.S., which has led the way out of the slump, inflation is only now holding above 2 percent. Wage growth has also remained weak, with possible explanations have including low productivity and greater-than-expected numbers of workers returning to the labor force. Still, the latest euro-area data show underlying price pressures are also building, creating further impetus for a policy shift. That will put the focus onto not only the end of easing, but the start of tightening. Estonia’s central-bank governor, Ardo Hansson, suggested on Wednesday that it might be sooner than investors expect.